If you divided the number of kilometres on the clock of my Landcruiser by ten thousand and called them years it would be just a little bit older than me. So we share a bit of camaraderie that comes with a few more groans in the suspension than we used to have. I’ve always thought of the car as a rugged individualist, which might be a bit of wish-fulfilment mixed with projection, and although we are sort of contemporaries and have a very close relationship honed by years, literally, on the road, I have never been sure of its gender until yesterday. It takes one car to know another, and I was surprised, and a little gratified to return after a hectic shopping expedition where I bagged enough Christmas presents to keep me out of trouble to find “he” was being stalked by this cute little Volkswagen. Note the feminist duco that I’m sure our OLO director Dale Spender would approve of, although she might find “cute” a little off. 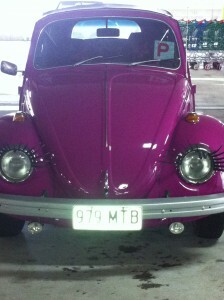 How do I know the Volkswagen is a girl? Well, as the close-up below shows, she has the most lavish set of false eyelashes since Tammy Fay Baker. I’m told this is a growing fashion accessory for your car, second only to the furry pair of dice dangling from the mirror which is designed to give an accurate idea of the cant on your car as you take the corner at the bottom of your parent’s street when you’re racing late from your boyfriend’s and want to beat the sun home. If the dice graze your quarto glass you aren’t going to make it. Well, she might be a little Bogan, but it’s the best offer whatever-his-name has ever had. The Mercs and BMWs just turn their noses up, and while he’s got quite a few toots from dual cab Hiluxs they’re just too much in your face. And when you find a good woman, you should just stick with her, especially when her eyes are as wide and luminous as these. 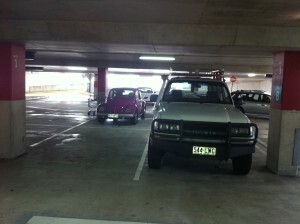 The cute little lime green Micra I was driving the other day thought the old truck had a certain je ne sais quoi about him!